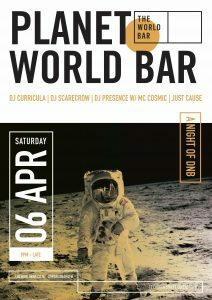 Load the shuttle we’re going to Planet World Bar on Saturday April 6. The cabin crew will be composed of the best drum and bass DJ’s anywhere. DJ Curricula, DJ scarecrow, DJ Presence and MC Cosmic and Just Cause.